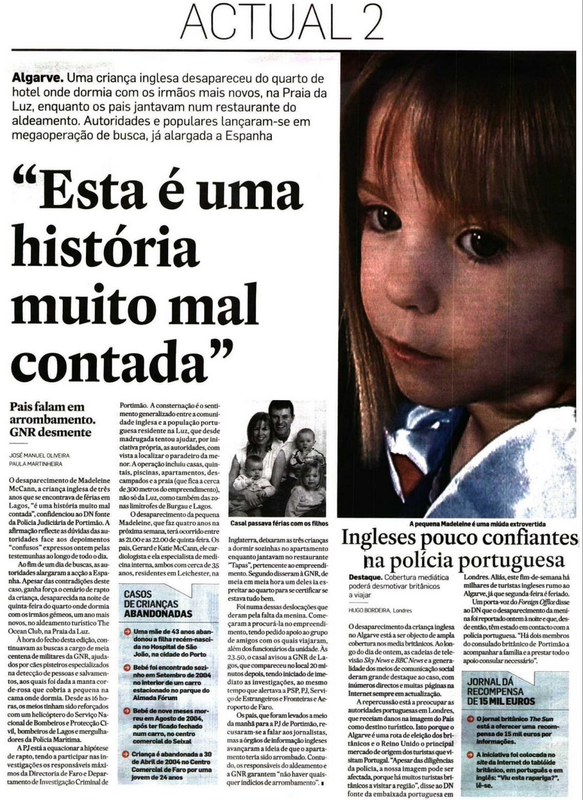 The disappearance of Madeleine McCann, the English three-year-old child that was on holidays in Lagos, "is a very badly told story", a source from the Polícia Judiciária in Portimão has confided to DN. The statement reflects the authorities' doubts concerning the "confused" depositions that were given by the witnesses yesterday, throughout the day. After one day of searches, the authorities have widened their action into Spain. Despite the contradictions in this case, the scenario of the child’s abduction is gaining strength. The little girl went missing on Thursday night, from the room where she was sleeping with her twin siblings that are one year younger than her, at the Ocean Club tourist resort, in Praia da Luz. At this edition's closing time, the searches were ongoing, carried out by approximately fifty elements of the GNR, aided by sniffer dogs that are specialised in the detection and rescue of humans, which were offered the pink blanket that covered the little girl in the bed where she was sleeping. Since 4 p.m., the means had been reinforced by a helicopter from the National Civil Protection Service, the firemen from Lagos and divers from the Maritime Police. The PJ is considering the possibility of abduction, and the heads of the Directory of Faro and of the Criminal Investigation Department of Portimão are taking part in the investigations. Consternation is the feeling that is generalised among the English community and the Portuguese population that reside in Luz, which have been trying to help the authorities, out of their own initiative, in an attempt to trace the little girl's whereabouts. The operation included houses, yards, swimming pools, apartments, open fields and the beach (which is located approximately 300 metres from the resort), not only in Luz, but also in the neighbouring areas of Burgau and Lagos. The disappearance of little Madeleine, who is to become four years old next week, has reportedly taken place between 9 and 10 p.m. on Thursday. Her parents, Gerard and Katie McCann, him a cardiologist and her an expert in internal medicine, both approximately 35 years old, residing in Leicester, in England, left the three children sleeping alone in the apartment while they dined at the "Tapas" restaurant, which belongs to the resort. According to what they told the GNR, every half hour one of them went to check the room in order to assure that all was well. It was during one of those visits that they noticed the little girl was missing. They started out by searching for her within the resort, having asked for support from the group of friends that had travelled with them, and from the employees at the resort. At 11.50 p.m., the couple alerted the GNR in Lagos, which arrived on location 20 minutes later, having immediately launched the investigation, at the same time as the PSP, the PJ, the Foreigners and Borders Service, and Faro Airport were alerted. The parents, who were taken to the PJ in Portimão at around mid-morning, refused to speak to the journalists, but advanced the idea that the apartment had been broken into, to the British media. Nevertheless, the resort's administration and the GNR assert that "there were no signs of a break-in whatsoever".